Karen balancing "Luna" with OM tuning forks. Many of you have or know of an animal who is suffering from injury or illness, or is struggling with behavior challenges. Often animal lovers easily recognize these challenges but do not know how to help their beloved friends. Our animals’ inability to verbalize what they need can leave their human companions feeling stressed and helpless. As a Healing Touch for Animals Practitioner I am dedicated to helping these animals by using a language they both understand - energy therapy. Healing Touch for Animals (HTA) is a holistic approach influencing the health and well-being of animals through energy and intention. Heart-centered energy therapy restores harmony and balance to the animal’s energy system while providing physical, emotional, mental and instinctual stability. Stabilizing the energy system allows the natural flow of the immune system which supports the animal’s natural self-healing process and promotes well-being. What happens during a Healing Touch for Animals Session? Upon meeting the animal in person or through distant communication, I assess the animal’s energy system and connect with his or her spirit. I will then utilizes appropriate HTA techniques using touch and intention to clear, balance and strengthen their energy system. This treatment may include aromatherapy with therapeutic-grade essential oils, sound and/or vibrational therapy with the use of tuning forks. Usually the first response noted is relaxation which is the foundation for optimal health. I will often receive messages from the animal in the form of pictures, words and feelings through animal communication which assists with the healing process as well. A single session can take up to an hour depending on the animal and situation. Healing Touch for Animals works in cooperation with traditional veterinarian medicine to provide the best care for our animal companions. HTA practitioners will work in conjunction with any veterinary diagnosed and prescribed treatment plan. As a cooperative practice this modality serves to bridge holistic animal health care with traditional veterinary science. I offer Healing Touch energy work in the comfort of the animal’s home or the environment where they’re most at ease. My range of travel, at this time, is open to all of the Florida Keys. If you are outside of the travel range or the home environment is not suitable this work can still be done distantly since energy is not limited by time or space. During distant work it is helpful to create a quiet and relaxed atmosphere for the animal during the scheduled sessions. The session will take place during an agreed upon time and be followed up by a telephone or email consultation for feedback and questions. Reference: Komitor, C. CMT, HTCP/I, CHBMT, HTACP, ESMT (2013). Healing touch for animals level 3 workbook (6th ed.). Highlands Ranch, CO: Komitor Healing Method, Inc. 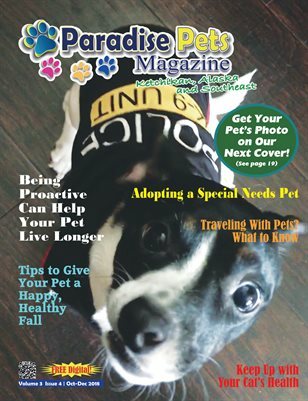 This article was originally published in Paradise Pets Magazine, Key West, FL Oct-Dec 2015. 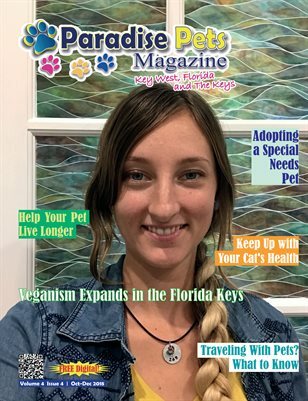 Click the cover image to read the FREE digital edition now.